“I feel like the students learned a lot about how the community works,” Julianne Brancadora, a Lincoln Learning Solutions Junior Achievement volunteer said. Brancadora is one of several employees from Lincoln Learning Solutions who joined other local volunteers for Rochester Area School District’s first Junior Achievement Day on November 16. 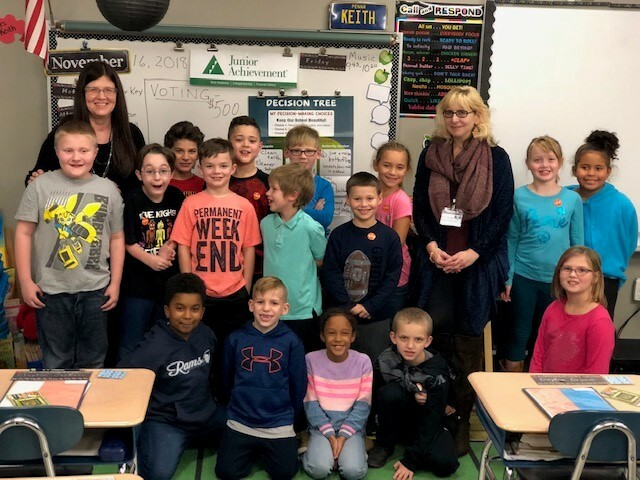 Junior Achievement (JA) of Western Pennsylvania is a nonprofit organization that uses volunteers to teach its financial literacy, work readiness, and entrepreneurship curriculum. As part of its philanthropic efforts, Lincoln Learning Solutions looks for opportunities to get employees involved within the community. 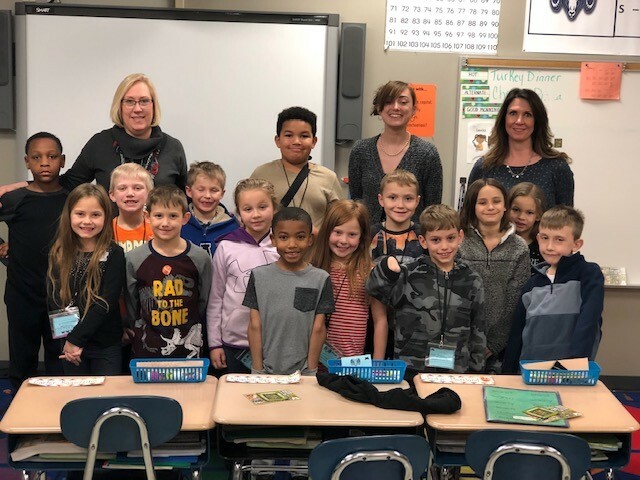 Because Lincoln Learning Solutions’ mission is empowering learning through educational products and services, matching volunteers with Junior Achievement was a perfect fit. This year’s LLS volunteers included Jennifer Telesz, digital media production associate; Dani Kassander, video editor/animator; and Julianne Brancadora, German teacher facilitator/curriculum developer. They taught the JA curriculum to first and second graders at Rochester. Junior Achievement volunteers are not required to have teaching experience. The organization offers training that covers its curriculum in addition to classroom management techniques. Classroom teachers stay with their classes throughout the day to offer volunteers support when needed. Bovalino explained that the district had several meetings with Junior Achievement to discuss the different curriculum modules available. They decided on the JA Day module for grades K-5, as opposed to JA’s weekly module. During Rochester’s JA Day, volunteers presented 5 to 7 lessons throughout the day, and each lesson was 40-45 minutes long. Volunteers taught more than 330 students. “The students enjoyed working together in teams, and it was obvious that they were learning valuable problem-solving skills as well as people skills,” Brancadora said of her second-grade class. Pam Gill, curriculum director and federal program coordinator for Rochester, explained that the district funded JA Day through Title IV as part of Act 339. One requirement of this statewide education initiative is for all districts to show college and career readiness in their students. Gill said she was pleased to see the Rochester teachers relating the JA curriculum to their own. 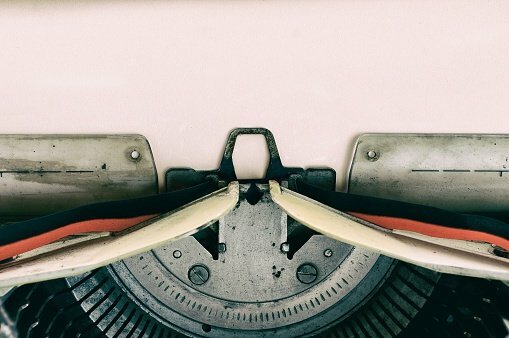 “[The curriculum] is very age appropriate and it is very well developed,” Gill said. 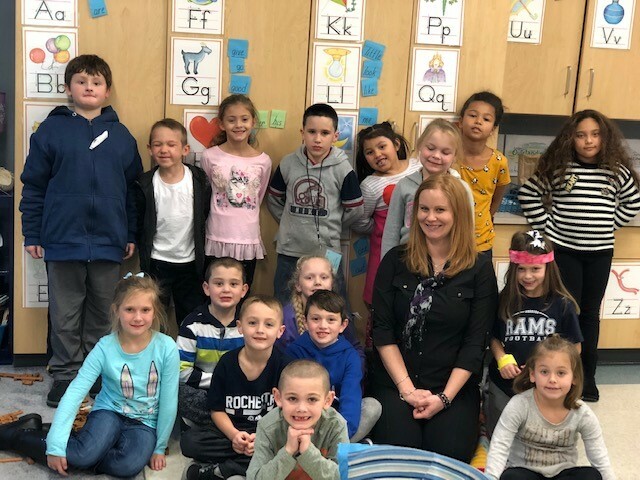 Donna Keith, a second-grade teacher at Rochester, said she was pleased to see her students learning good communication skills through the JA curriculum. “Children don’t practice enough communication. They are learning that others have opinions and that they have to work things out [when opinions differ],” she said. LLS volunteers Kassander and Telesz agreed that students responded well to JA Day. “They were so enthusiastic and excited to be part of it,” Kassander said of her second-grade class. To learn more about Junior Achievement and the programs they offer, visit https://www.juniorachievement.org/web/ja-westernpa/.